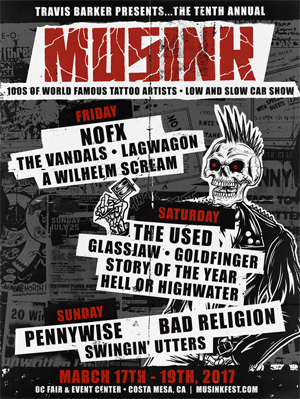 The 10th annual MUSINK, presented by Travis Barker, is set for March 17, 18, and 19, 2017 at the OC Fair & Events Center in Costa Mesa, CA. The three-day tattoo convention, car show and concert is America’s largest tattoo and music festival, featuring hundreds of world-renowned tattoo artists, Famous Stars and Straps presents the Low and Slow Car Show, a vendor village and music from headliners NOFX, THE USED, BAD RELIGION, PENNYWISE, and more. MUSINK attendees are invited to check out Famous Stars and Straps presents the Low and Slow Car Show, which will display some of the best American classics and lowriders in Southern California, including some from Travis Barker’s own collection. Daily tattoo contests will take place during the car show as well. MUSINK hours are 3:00 PM - 10:00 PM on Friday, March 17, 12:00 PM - 10:00 PM on Saturday, March 18, and 12:00 PM - 9:00 PM on Sunday, March 19.